I often find that businesses dive into using Facebook without having a plan in place. Their initial enthusiasm wears off and they either stop completely or start obsessing about numbers of Likes or how many people are talking about their page. 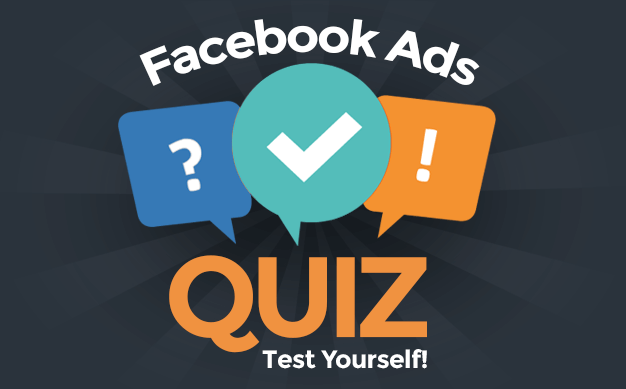 One statistic that I do think is worth obsessing about is how many leads you are getting from Facebook. A lead could be something as simple as an email address, a customer coming in the door or something more qualified. You could prompt a potential client or customer to provide you with more information so that you know how best to approach them and convert your lead into a sale. A competition of some kind is still one of the best things you can do to increase page Likes and generate leads. By using competition applications such as ShortStack you can gather extra information on potential customers. Think about what information you need. If it’s an email address, make sure that you also get permission to contact them again. Depending on your business you will require different information; maybe you need to know where they live, what age group they fit into or something more specific. Try to keep it simple. The more questions you ask, the fewer entries you will get. It can be a fine balance between getting to know more about your lead and putting them off completely. It’s also important to choose a prize that will attract your target market. If you can give away your own product or service, this is ideal. If not, think carefully about what will attract them. For example, if you are targeting women, a chocolate hamper might be the best choice. If you are targeting men, tickets to a sporting event might work well. We very often forget to sell via Facebook. Yes, it’s true we shouldn’t drown our Facebook audience with sales posts, but you can sell if you choose the right language. Rather than creating an image full of text about your latest special offer, think about pairing it with a good image or a tip that enhances your message. Then be sure to add a phone number, email address or link depending on how to buy. 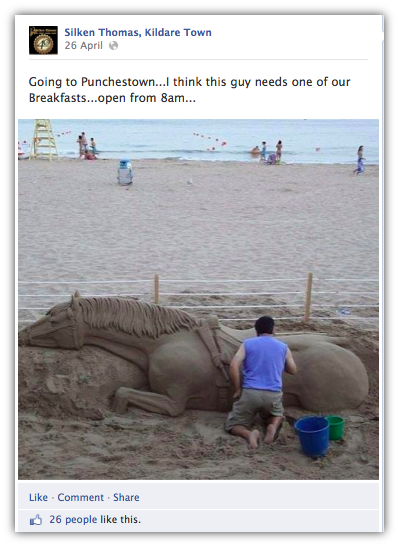 This example from a local pub, the Silken Thomas in Kildare, Ireland, is designed to appeal to those attending a nearby horse racing event. If you are a retailer, you may want to encourage more people to come into your store as that’s where the lead conversion happens for you. Maybe you want to put together a deal, for example a free cookie with every cup of coffee or maybe a discount like the one below from Joyce’s Hardware Store. Giving people an amusing phrase will also create a bit of a buzz in store when people repeat it. You probably have a lead generation form on your website of some sort, whether it’s “Get our Newsletter,” “Contact Us” or “Apply Now.” It’s the way that you currently collect contact info for potential leads. 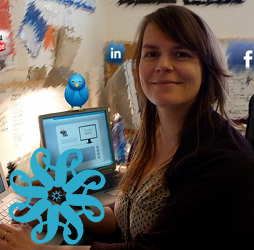 By adding tabs to your Facebook page you can also facilitate lead capture. Think about adding a “Contact Us,” “Book Now” or “Subscribe” tab, making it easier to capture leads without sending customers away from Facebook. It’s easy to create a customized tab. I’m going to mention ShortStack again as I’m a massive fan, but what I like about their apps is that they work for both desktop and mobile users. There are some other great choices out there, too, including Pagemodo and Static HTML. Here’s an example on Robert Redmond Photographer’s Facebook page. Notice he is asking which service the customer is interested in and when their Wedding date is when applicable. One thing you have to remember with Facebook tabs is that people rarely visit them unless you link directly to them from your content or ads. You will need to work links to them into your posting schedule to ensure you capture leads. Your existing customers are possibly your best sales people. 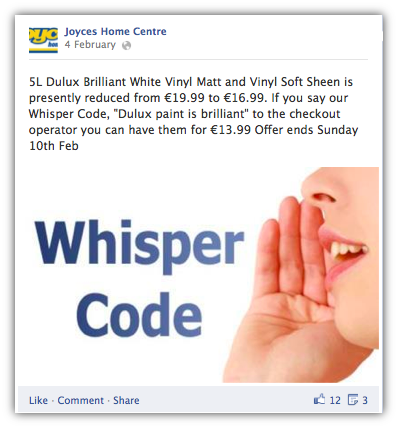 As with offline word of mouth (WOM) marketing, Facebook facilitates the endorsement of what you do. Make sure your existing customers are active on your page. Ask them questions, thank them for their participation and give them good, relevant content they can share with their friends. 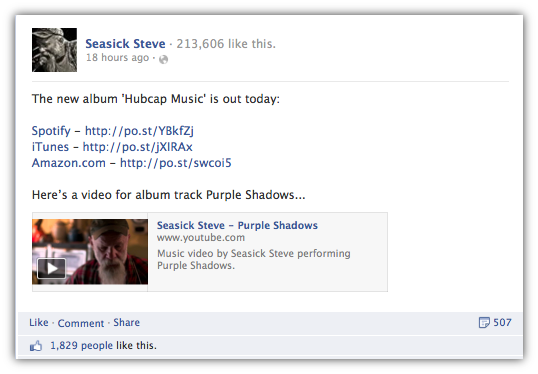 If you are an existing fan of Seasick Steve you are bound to want to buy his new album, but by combining his sales post with a video from the new album he is encouraging us to share with our friends. I was delighted when the Facebook Offers tool was launched. It’s a great way to measure return on investment directly, but to turn it into a lead generation tool you’ll need to do a bit more. Whether you are a bricks and mortar store or an online retailer, you should always choose the “Online Only” option when creating your Offer. 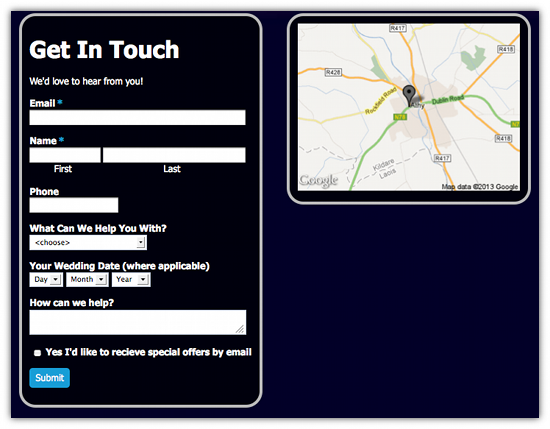 This way you can collect more information about your customer and send them your own voucher. Even if you don’t have a website you can set up a custom page on Facebook or even something as simple as a form within a Google doc to collect information. This way you will know exactly who is claiming your Offer and have the opportunity to get all of the relevant information you need to help your potential client or customer. Here’s an offer that was snapped up pretty quickly for The Dublin Meat Company. This isn’t a definitive list of lead generation ideas. I’d be delighted to hear your ideas, and if you have tried any of these tactics how they have worked for you. Please let me know your experiences in the comments below!